When you’re the first female jurist to serve in the state of California, celebrity finds you, whether you want it or not. Today, police began investigating a series of death threats sent to Municipal Judge Georgia Bullock. The letters had been arriving steadily for six weeks, but Bullock hadn’t taken them seriously until last week, when she realized she was being followed by a lone figure in a large car. The most recent missive read, "Leave state at once. Your life will go and you will get this." Beneath these lines was scrawled a crude drawing of a revolver. The note was signed "Black Hand Boston – You Cannot Escape." 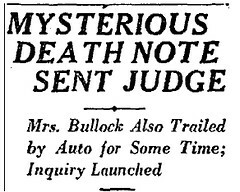 Bullock had received similar threats two years earlier, when she received her first appointment as a police judge in December 1924. Shortly after assuming her post, she was the victim of a half-hearted poisoning attempt, when a "woman of foreign appearance" left a box of strangely-colored fudge in her quarters. Happily, the villains never succeeded in carrying out their threats, and Bullock went on to serve as a judge in Los Angeles for 32 years until her retirement in 1955. She specialized in hearing cases involving marriage, divorce, and homeless children, but her happiest years came at the end of her career, which she spent in the Adoption Department of the Juvenile Court. Upon her retirement, she said, "I’m going to miss it. I’ll miss seeing the little ones that have been such darlings in my courtroom these last twelve years, and I’ll miss watching that wonderful happiness that childless couples show when they are adopting children." Bullock died April 29, 1957, leaving two children, five grandchildren, and two great-grandchildren. < The Killer Slide of Long Beach	> And Only One Ring Tone!